Craving comfort food minus the high calorie counts and long ingredient lists? Today's trios are here to save the day! One of our favorite pasta swaps gets super sauced and topped with meatless meatballs... Future classic here! Microwave whole squash for 6 minutes, or until soft enough to cut. Slice into quarters; scoop out and discard seeds. Save three quarters for another time. 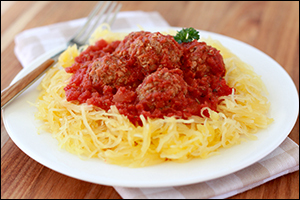 Place one spaghetti squash quarter in a large microwave-safe bowl with 1/4 cup water. Cover and microwave until soft, 5 - 8 minutes. Scrape spaghetti squash strands out with a fork, and transfer to a strainer to drain excess moisture. Measure out 1 1/4 cups, and place in the bowl. (If needed, cook up another squash quarter. Save any remaining for another use.) Cover to keep warm. Place meatballs in a microwave-safe bowl, and heat according to package instructions. Meanwhile, in a small bowl, season tomatoes to taste. Add seasoned tomatoes to the meatballs, and toss to coat. Microwave for 30 seconds, until hot. Top squash with saucy meatballs, and devour! 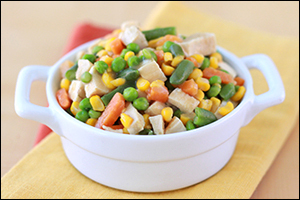 Place frozen veggies in a medium microwave-safe bowl. Microwave for 3 minutes, or until hot. Blot away excess liquid. Mix in chicken and gravy. Microwave until hot, about 1 minute. Yum! 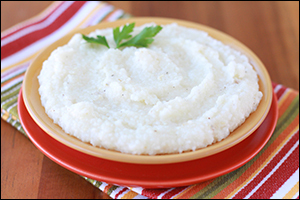 Quick-cooking grits + our favorite creamy cheese make this trio too good to skip over... Southern-style comfort in a snap! Add 2 cups water to a medium pot, and bring to a boil. Add grits, and stir well. Reduce heat to low. Cover and cook until smooth and creamy, about 5 minutes, uncovering occasionally to stir. Remove from heat. Stir in 1/4 tsp. salt and 1/8 tsp. each pepper and garlic powder. Add butter and cheese, breaking the cheese wedge into pieces. Stir until cheese and butter have melted and mixture is uniform. Enjoy! Make sure your pals have awesomely easy recipes -- click "Send to a Friend" now! Since it's October 9th, Submarine-Hoagie-Hero-Grinder Day, it's probably a good time to brush up on your sandwich-ordering skills with this Subway survival guide!